I discovered Etsy recently. And I am THISCLOSE to making this entire blog post a link to the website. Yes, I love it THAT MUCH. 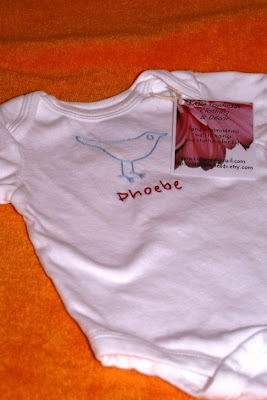 Last week, I ordered some hand-embroidered onesies from this shop. They arrived yesterday and are so freaking cute I want to eat them. Now, I firmly believe that everyone is gifted with an ability to make something with their hands. My talent? Food. I do not have the patience (but sadly I have the imagination) for crafts. I get inspired, buy stuff, and never finish the project. With food whatever you're making is done in a reasonable amount of time. And even if it turns out badly, you can always add salt or hot sauce and make it palatable. Not so with crafts or other "house" projects. So Etsy fills a deep need in my life. I can satisfy all my crafting urges by going there and living vicariously through all the extremely talented people making things for sale. And I like buying things directly from them -- I think a lot of people on there are moms just trying to earn some extra cash. And I love supporting that. And the vintage stuff is SO COOL, too. I am so inspired by the creative things on Etsy, I've even gotten a bug to decorate Phoebe's room (currently just white walls, white crib, new rocker, old old old dresser/changing table) ... I want it to be the colors I love: pale blue and dark red ... I know, our wedding colors. But I love those colors. They're so vintage, but so fresh. I only wish food was so easily shipped. With my new stove, I may have to send my new favorite Baby Atelier some homemade cookies. And this, folks, is why I love America.